Today I published a web application that I have worked on for a while and we have used three or four times at Seacoast Church to take live questions during a message. This allows the people attending the event to text in or use a web page to submit anonymous questions. For more information see the Github page. The application is built so that the attenders post questions and they show up on an incoming questions tab in the admin section. You can have one or many editors monitoring this page, editing and approving questions. Once a question is approved, it is then cued on a approvals page that can be monitored by the moderator on stage. The moderator then just clicks on a question for it to be displayed on the screen. All clients need web browsers and internet access including the device used to feed the screen. 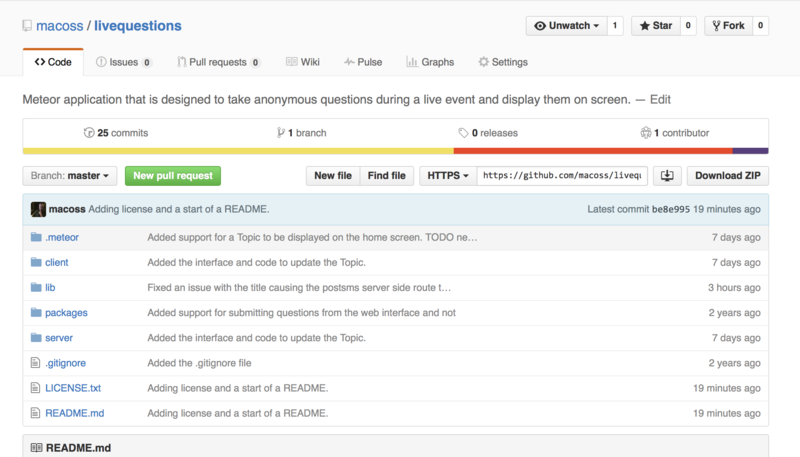 LiveQuestions can be easily deployed to Meteor’s free basic hosting for testing or even production for events.